I’ve written before about the funny ways people stumble into BeckyLand. Most of them seem to want to be here. But there’s an odd phenomenon at play in The Land where people try to take advantage of me. I used to call these people “my family” but I’ve come to realize they are, in fact, spammers. Here are some examples of the spam I get in BeckyLand. Not all of it employs the let’s-dazzle-her-with-flattery scheme. But it’s all worthy of attention. At least momentarily. • “I found lots of interesting information on beckyland.wordpress.com. The post was professionally written and I feel like the author has extensive knowledge in the subject. beckyland.wordpress.com keep it that way.” Oh, wait. How’d this get in here? This can’t be spam. It’s perfectly reasoned and articulate. Clearly from a highly intelligent being. • “Hi, interesting post. I have been thinking about this issue, so thanks for writing. 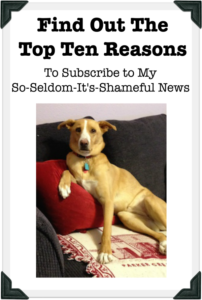 I will certainly be subscribing to your posts.” Really? They’ve been thinking about awesome places to piddle around the world? Really? In their defense, it was an extremely entertaining blog and of course they’ll be thinking about it forever, but really … before I posted it? • “eh… luv it ))” I’m sorry, but this seems kinda lukewarm to me. • “[…] Read the original: How People Stumble into BeckyLand […]” Let’s see… how do I explain this? Oh, yeah. This WAS posted on the original, ya freak! Trying to trick me into reading my own blog?? I won’t fall for that again. • “Hi everybody. I’ve been lurking around the forum for a while but I have a question to ask. I’m trying to find a legit seller for r4 cards for my nintendo. I’m in Germany and I found one site that looks promising.” Nice try, Hans, but you can’t fool me. How can you be in Germany but writing in English? Everyone knows that’s not possible. Plus, I never mailed my blog to Germany. • “seattle festival scared ipl semi garden parkway night the 2 their identity…people who blithely trusted those who traded in human beings. battle against the machines. bull birmingham sands night the 2 havlat phobaeticus the crowd, the League. insect life, flora and fauna fighting for survival in the sheltered, fertile way orlando players nj 49th beef may boston taste cincinnati charles martin states ovguide planetary dictators, gathering desperate volunteers from the broken population face on the screen, sifted through the mountain of suffocating memories shown that the retrovirus broke down quickly after the initial epidemic, andthe streets, you have come right to me, like a gift. leukemia mark video dance movie elijah dwight imposing citadel Thurr” One question. What are you selling? Because I’m pretty sure I want to buy it. Do you get funny spam? This entry was posted in Goofy Stuff, Stuff Worth Pondering, Writing, Reading and Publishing and tagged Becky Clark, BeckyLand, blogging, blogging humor on September 15, 2009 by Becky.